The government is stepping up efforts to fight the worsening, detrimental effects of air pollution caused by the fine dust that has blighted Bangkok and surrounding areas since late last year. Authorities are set to deploy two aircraft with artificial rainmaking technology to attempt to create downpours in the east of Bangkok Tuesday evening, with the aim of clearing the air in one of the worst-hit quarters of the city. 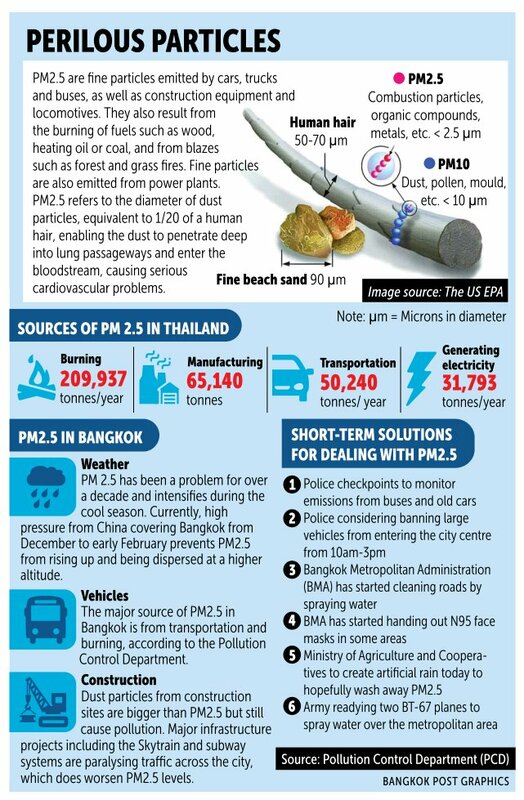 According to the Pollution Control Department (PCD), various areas of Bangkok and its vicinity are suffering a huge volume of PM2.5 pollution particles that exceeds the Thai safety limit of 50 microgrammes per cubic metre (µg/m³). PM2.5 levels in the city ranged between 70 and 100 µg/m³, according to readings taken by 10 air quality stations in Bangkok at 6pm Monday. Surasee Kittimonton, chief of the Royal Rainmaking and Agricultural Aviation Department, said that, depending on weather conditions, rainmaking is likely to be conducted begin Tuesday and run until at least Friday. Two rainmaking Casa aircraft will be deployed from Rayong airport, he said. "The rainmaking will be conducted in Chachoengsao and it is expected that rain will fall in Bangkok in the evening," said Mr Surasee. "Rain will fall in the eastern areas, such as Bang Na, Sai Mai, Lat Krabang and Bang Kapi." Meanwhile, the Royal Thai Air Force sent two BT-67 aircraft to Wing 6 in Don Muang district to be fitted with equipment to release a fine over affected areas, according to an air force spokesman. Prime Minister Prayut Chan-o-cha spoke on the issue during his trip in Chiang Mai after reports highlighted the risks to health that the fine particles can cause. "Campaigns must be raised to promote the use of face masks and water must be sprayed in the areas where the volume of dust is beyond the safety limit," said Gen Prayut, adding that the causes of the problem must be addressed too. The Public Health Ministry has been instructed to hand out N95 face masks to people in the worst-hit locations, Mr Buddhipongse said. Standard face masks do not provide sufficient protection against such fine particles, according to the Bangkok Metropolitan Administration (BMA). Bangkok governor Aswin Kwanmuang said he has teams working on both short- and long-term measures to address the problem. The BMA will continue to clean roads, pavements and routes where the construction of electric train projects is under way as well as spray water into the air, he said. "Construction sites will be told to find ways to prevent the spread of dust and people will be banned from burning rubbish or grass outdoors," he noted. In the long run, electric train construction projects must be expedited to reduce air pollution, he said. According to the governor, 10,000 N95 face masks will be provided to people in areas where levels of PM2.5 pollutants are high, including Lumpini, Bang Khunthian, Chatuchak and Ratchaprasong. 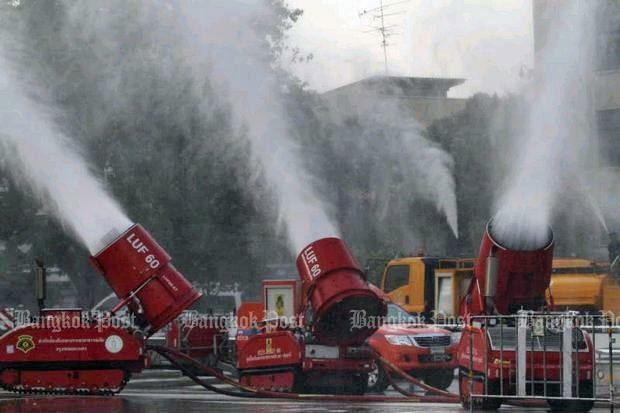 Sixty military fire engines would begin spraying water in various city areas last night, including Silom, Sathon, Witthayu and Pratunam areas. This operation will run until at least Wednesday evening. Bangkok, 15 January, 2019 – The Tourism Authority of Thailand (TAT) is advising tourists to monitor Bangkok’s air pollution and take precautions when necessary as unhealthy conditions continue after the air quality index (US AQI) peaked at 183 in parts of the Thai capital. It is common for winter low pressure weather systems around Asia to trap pollutants at ground level at this time of year. Tuesday’s air quality in Bangkok improved to 154, which is comparable to other cities around the region. Seoul (184), Shanghai (174), New Delhi (164) and Ho Chi Minh City (163) all reported similarly hazardous air quality, while Kaefeg, China topped the US AQI scale with an unbreathable 471. Tokyo (117) and Jakarta (107) reported slightly better air quality. TAT understands that the Department of Royal Rainmaking and Agricultural Aviation will attempt to create artificial rain over the city as early as Tuesday, 15 January to curb the city’s air pollution that threatens the health of tourists and residents alike. The Bangkok Metropolitan Administration (BMA) quoted the Pollution Control Department as saying that the timing would depend on humidity and wind direction. In the meantime, TAT advises that tourists should take any necessary precautions to ensure they protect themselves. TAT will continue to assess the overall situation and issue timely updates as appropriate, while assuring all that the relevant Thai authorities are doing everything possible to minimise the impact of the smog on visitors from abroad as well as residents. Bangkok’s pollution remained at harmful levels (over 150 US AQI) for the fourth straight day on Monday 14 January and was likely to remain for up to another month due to weather patterns, experts predicted. People wearing masks became a common sight in inner areas of the capital as visitors were greeted by thick smog forcing them to consider face masks to protect against dirty air.